On our boat there is a “sports fisher“ who is fishing for the Giant Trevally (Caronix ignobilis) with baits. This fish is found around the north western islands of Hawaii in record sizes, and on the fishing rod they are exceptional fighters. 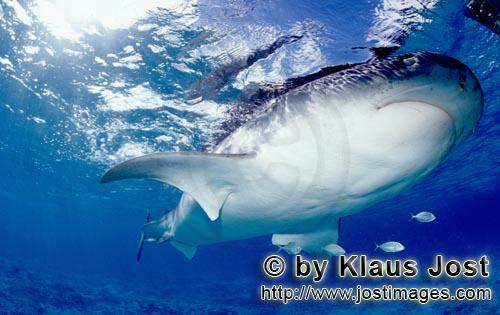 Sometimes, such an activity lures Tiger Sharks (Galeocerdo cuvier). The Tiger Shark belongs to the family of the Gray Sharks (Carcharhinidae); it is the only species of the Grey Shark with suction holes. Tiger Sharks are incredibly impressive and large sharks which can reach a length of more than six metres. The name is due to the striped pattern on the grey back of the animals, which becomes increasingly paler when they are grown. The big, broad and bulky head and the diagonal stripes, similar to the stripes of a tiger, are a reliable distinctive mark. Typical for the Tiger Shark are also its broad mouth, broad nose, a long barrel-shaped forebody and a narrow, slender tail end. Together with the Bull Shark and the White Shark, the Tiger Shark – it is said to cause most of the accidents in the tropics – belongs to the “most dangerous sharks species“ (any animal could be dangerous to humans). Tiger Sharks have the highest developed teeth. Despite their carapace, even sea turtles are not safe from them because of the sharks’ unique masticatory apparatus. Considering a pressure of the teeth of up to three tons/cm², this is not surprising. Tiger Sharks have the broadest food spectrum of all sharks. Apart from sea turtles, seals, sea lions, other sharks, whales, and sea birds, they also eat invertebrates, garbage and carrion. Tiger Sharks are mainly found in tropical and warm to temperate seas. They are found in the coastal region as well as around archipelagos as Hawaii, the Marshall Islands, Galapagos, Fiji and Tahiti. Adult animals don’t have any natural enemies, the only threat is the human.